No, I am actually not talking about the NER but my own stupidity this time. This day went completely wrong for no reason and I passed up salvaging it time and time again for fear of not being able to get back to Delhi without my reserved ticket. 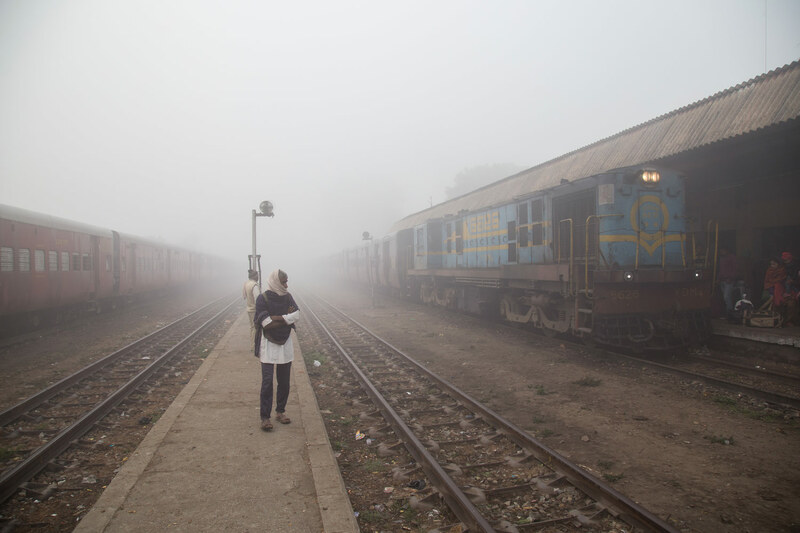 We had planned to chase the train south to Mailani but after waking up to peasoup fog we decided to abandon that plan after a short drive south of town to see if it cleared. Really we should have continued with that plan as even with the fog we could have done some interesting shots and it turns out it was only a localized issue. 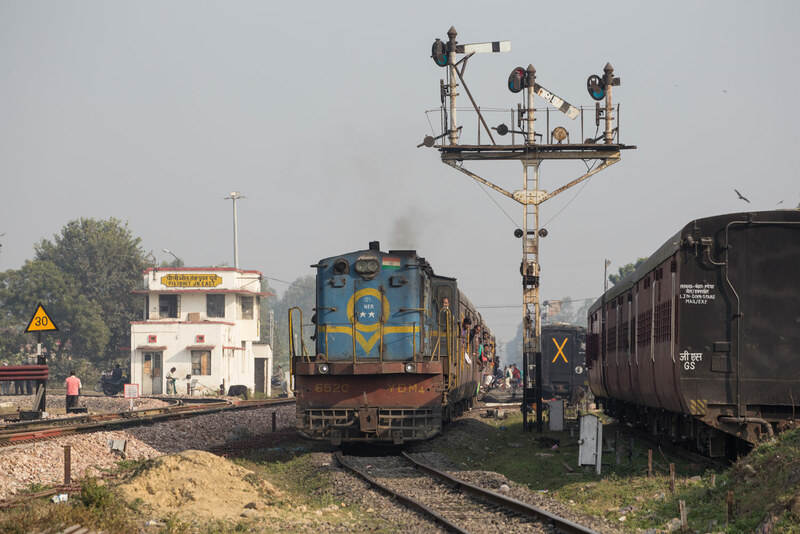 We headed back to Palia Kalan I decided to go ride the northbound 52252, thinking maybe I would travel the whole line to Bahraich. While waiting I snapped a few photos of what I believe was the old rake of the Gokul Express which previously ran from Gonda to Kasanj. The train board simply read Gonda to Mailani passenger which is what the Gokul was reduced to in its final days. After a long wait 52252 finally emerged out of the still thick fog. 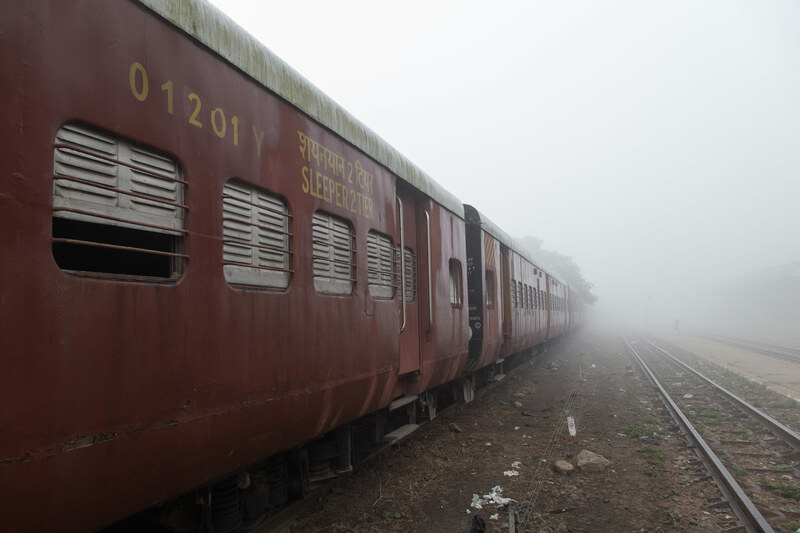 I climbed onboard and we thrashed away to Dudwa, then something strange happened….the fog almost immediately lifted and by Dudwha station it was bright sunshine. Stupidly I decided to go back on the crossing train here and continue onto Mailani thinking maybe I could do some photography on the Mailani to Pilibhit segment or ride the train to Shajantapur. Mistake number 2. At Palia I again met up with Thomas and Robin who had spent the time in the hotel. After we crossed the Sharda River which was still thick in fog the sun again started to emerge, infact it was probably the best sun we had the whole time on the NER. I felt like a total idiot for passing up the chance to chase the train as we slowly rolled through the countryside, this would have been perfect for chasing but extraordinarily boring for riding. 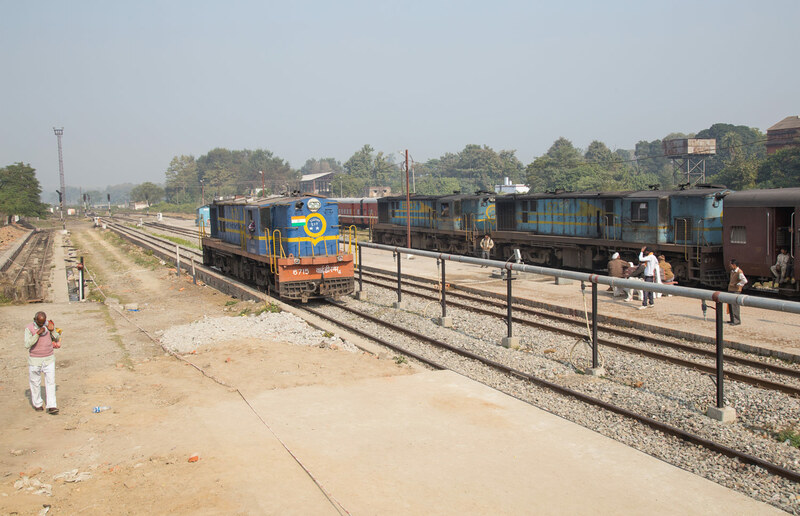 At Mailani I once again was treated to watching the runaround movement, interestingly the Mailani to Bahraich train had a pair of YDM4’s, 1 dead in tow. Had this train been running been going the right direction of the sun I wouldve hopped on as getting a pair of YDM4’s even if one isnt online is still quite a rare sight. Even in the past only a few prestigious trains ever got pairs of YDM4s. 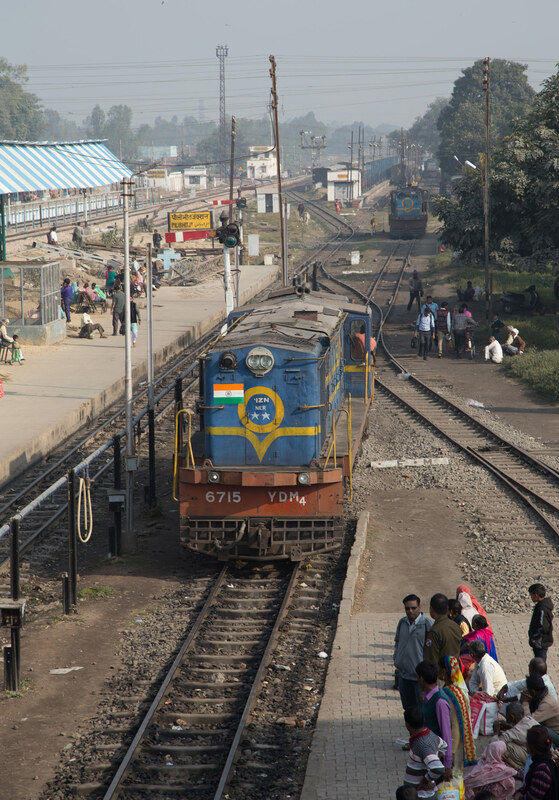 Just one option left and that was nixed too when I got to Pilibhit and found the outbound train to Shajantapur (which was formed by our rake) was also going to be wedged to the gills, no chance for photos or even enjoying the ride on a train like that. 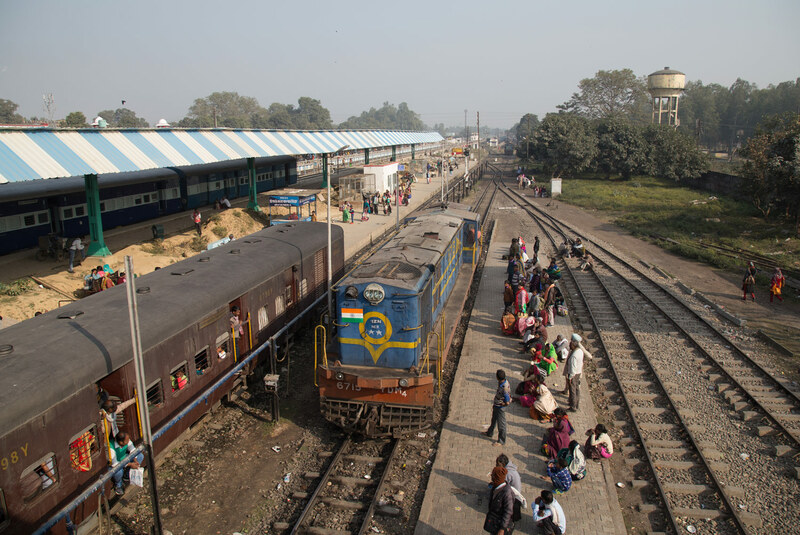 So regretfully I got a few shots of the inbound Shajantapur train and with great regret boarded the BG passenger to Pilibhit. 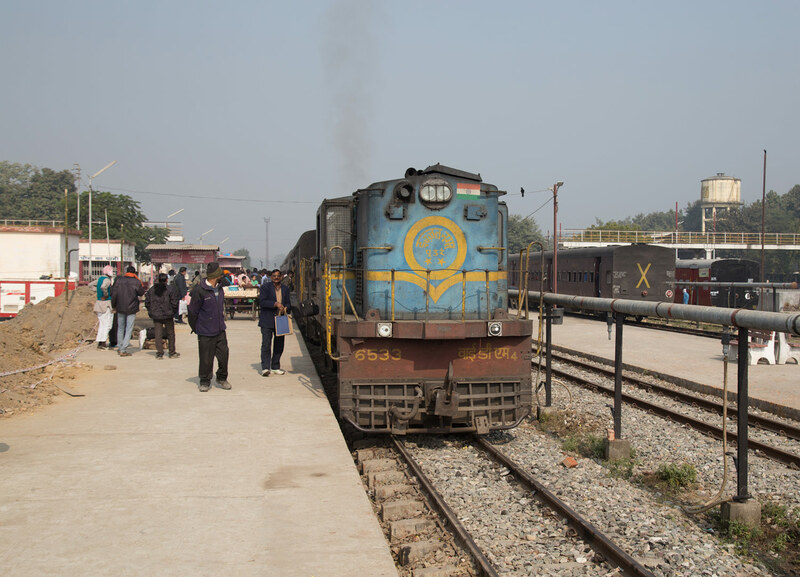 Above: The locomotive from our train from Mailani runs around to form the outbound service to Shajantapur. 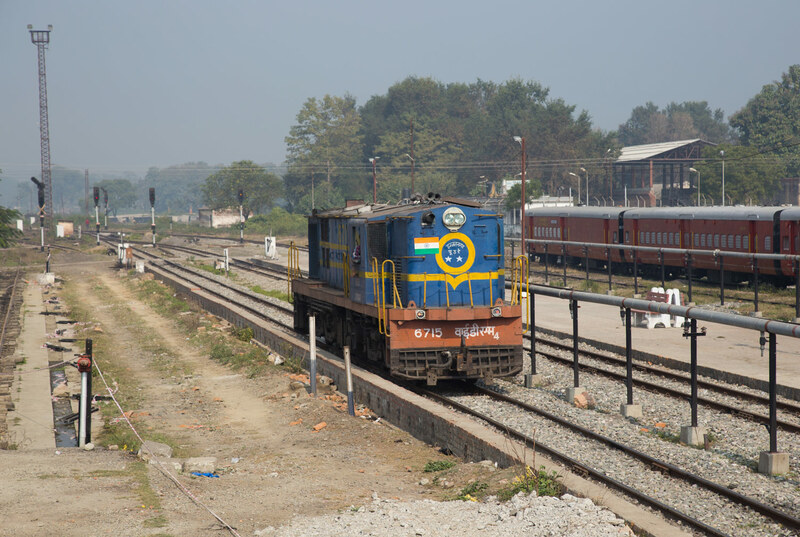 (Below): Train 52232 arrives from Shajantapur. Due to track rationalization after gauge conversion only one train can enter the station at a time, this train had been holding just outside the station for ours to enter. I was not a happy camper, the NER is easily the most complete of the few remaining MG systems and I hadn’t even close to given it justice in two days. Thankfully we found a decent hotel bar and I proceeded to drown my sorrows with Kingfisher (ie: the only beer available in half of India) as our train to Gwalior was as seemingly everything on the is NER…..late. Turns out I could have easily done any of my plans save for going to Bahraich and still made the overnight as late as it was. Onboard there was another problem as I had booked our ticket for Lucknow expecting to board there since Philibit to Mailani was supposed to be closed before our visit, our berths as I should have expected were taken and it took awhile for the TTE to sort out. Eventually we all got separate births and I passed out to awake the next morning to find us standing at Hazarat Nizzadmun station, it was already 4:50 in the morning, we were supposed to have been long gone from here. Having had quite enough I decided I needed a break so got my stuff and got down and after waiting till a more sane hour headed to my grandparents flat to relax for a day ahead. I should have gone to Gwalior but there were a lot of should have’s as well as shouldn’t haves this trip. The NER at this time of writing is still operating all the metre gauge routes that we travelled but Philibit to Mailani could still close at any time, we saw extensive preparation for gauge conversion the whole way so its only a matter of time.